You may not know the band yet but you know many of the players. 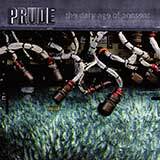 Prude is a vicious agglomeration of disparate talents working together, fronted by legendary loud mouth and conceptual terrorist Jared Louche from the seminal Machine Rock band CHEMLAB. Industrial agitator Matt Fanale from the sarcastic CAUSTIC brings blistering noise, white light guitar star Marc Olivier from London's PLASTIC HEROES is the essence of rock'n'roll, electronics guru Phil DiSiena (Infocollapse/Cyanotic) provides sleazy grooves, and producer supreme Howie Beno (13mg/Ministry/Blondie/DM) weaves it all into a merciless Molotov. Prude's debut album the dark age of consent' is a wild, acid-tripped puree of 1970's New York punk and glam retrofitted with a harsh, damaged electronic edge. It's a late night, post-rock, electro-experimental punk record of distorted proportions. It's Iggy and The Stooges, Nine Inch Nails, The New York Dolls, T-Rex, 1000 Homo DJs, Roxy Music, George Bataille, Salvador Dali, and Robert Mapplethorpe all filtered through Louche's blast furnace writing. The album was recorded and produced over three years and three continents and mastered at London's legendary Abbey Road Studios by Sean Magee. It's going to blow your skull in two and have you begging for more. 02. great eraser (in the sky). 04. plague star (black light burning). 07. brief history of fire. 10. sniper (at the gates of dawn). 11. kings of the republic of nowhere.